This enticing condo is truly remarkable! Located where Breckenridge meets the majestic mountains, this beautiful property rests directly on the Peak 9 Base Area and is bordered by Maggie Pond. 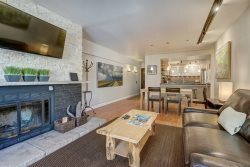 The Village at Breckenridge is also conveniently located less than one block from the premiere Main Street shopping, dining, and night-life that Downtown Breckenridge has to offer. Guests who are dreaming of staying right inside the heart of our all year-round activity should certainly stay in this beautiful condo! The sophisticated interior of this gorgeous condo has been recently renovated. Massive, lustrous windows give the unit a spacious feel and also an abundance of natural light. With three boundless bedrooms, three elegant full bathrooms, and enough bedding to comfortably sleep ten adults, this unit is guaranteed to please family and friend groups. The grand, master suite guest will enjoy a luxurious queen bed and views of Peak 9 and Quicksilver Chairlift while guests in the other great bedrooms will have views of the magic carpet. The double vanity, master bathroom provides plentiful space for busy mornings and the large double-glass shower is a great add-on. You will find this magnificent condo comes stocked with all of the items essential for a great vacation: Central heating, a gourmet kitchen, that is fully stocked with plate ware and cookware, two flat-screen TVs with cable, high speed wireless internet, and more. After a day on the slopes, you can choose to enjoy your meals around a stunning wood table in the adjacent dining area, with seating for 6 guests, or the fun-tastic barstool seating at the kitchen counter. This spacious condominium suite is perfection for year-round fun. In the glorious winters, guests can enjoy skiing, easy ski school access, snowboarding, dog sledding, snowmobiling, cross country skiing, and much more! In the summer, guests are able to go swimming, biking, fishing, golfing, horseback riding, white-water rafting, and an abundance of more activities! In terms of location, it is virtually impossible to rise above the Village at Breckenridge! The resort is known for its prime location and for being a true ski-in / ski-out property. Resort amenities include indoor/outdoor pool, hot tubs, sauna, steam room, exercise room, cable TV, and free wireless internet. We loved the condo. It was perfect. We stayed with the entire family - wanted a bigger space bc of toddler. It was perfect for us/him. Not much for him to get into trouble with :) Great space for a ski trip. The folks at Ski Colorado were very responsive and accommodating! Very nice condo. Nice condo, very clean, easy to check in and out. The condo was beautifully updated, clean, and very comfortable. Dishes, small appliances, and a washer and dryer are provided. Each bedroom has a bathroom on-suit. There is a bathtub in the room with bunk beds. The other two bathrooms have showers, one being an extra nice and spacious shower. I would not hesitate to stay here again.